This specific year the inspiration for the caricatures came from my own person exploration of a style known as Steampunk. Steampunk is a subgenre of science-fiction and fantasy that came out of literary works such as Jules Vern and H.G. Wells to name a couple. But Steampunk can be best described by breaking up the word. “Steam” represents the era mostly the early industrial age around the early to mid-Victorian Era. “Punk” represents rebellion or going against the norm. The “Punk” or rebellion signifies going against what is expected on the technology level as well as societal norms. On the technology level you see cars that are steamed powered, flying dirigibles or airships the size and look of sailing vessels or even steam-powered walking machines. Yet when it comes to rebellion on the societal side, it affects women the most. During this time women were relegated to subordinates to the men, covering up themselves, not taking up employment or independent behavior. That is why in Steampunk you will see many women showing cleavage or wearing short skirts and showing a lot of leg to show off their stockings. The first caricature is a person whom I wanted to show their rebellious side. 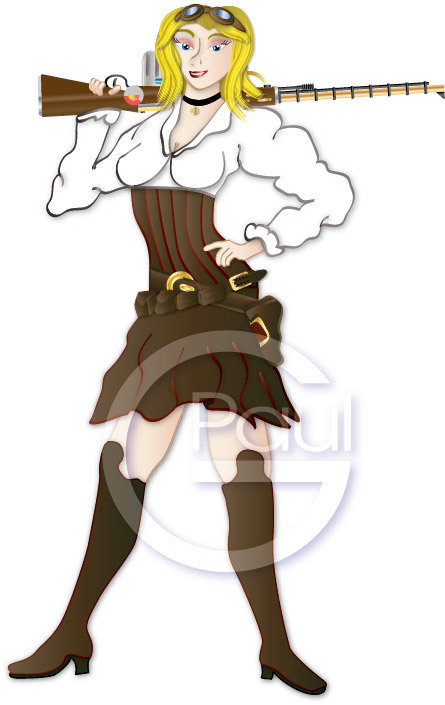 I wanted to create the caricature with a skirt and high boots along with the customary leather corset. I then added the puffy shirt that highlighted the breasts and cleavage. I then added the two belts with packs, goggles and finally a steampunk style rifle. With these caricatures I created a new way of creating hair and with caricature she has long shoulder length blonde hair. The second caricature is a person who is one that would help anyone if they asked for it. I wanted to show this person with more of a rebellious side; hence I began drawing her wearing a corset and short skirt or slip with the dress frame on the outside. However, I took this one step further by drawing the caricature showing a lot leg that showed off garter stockings. I then added a tight shirt that showed off a bit of cleavage. I finished off the caricature by adding a pair of steampunk binoculars and a flintlock pistol, for that “don’t mess with me” look. The third caricature is a person who is always thinking of others a typical mom. I wanted to show that this person is adventurous but someone you can rely on. So I decided to draw her with a pith helmet, with a matching corset and long dress. But I wanted to show that she is always prepared so I added the bag with pencils and a book. The fourth caricature is a person who is always ready to lend a helping hand but also adventurous. I wanted to show that adventurous side but also her independence; therefore I drew her wearing pants, which was unthinkable during Victorian times. I drew here with a corset but no shirt for some added daring. I was thinking alone the lines of an aeronaut / pilot of a dirigible so I added the aviator cap with goggles. I added the bag and sidearm to finish the look. The fifth caricature is a person who can be best described as stead and reliable. I wanted to show that person could have an adventurous side but also be humble with what she does. I began with a short dress it would have a train so to show some leg. I added the corset with a stylish bra and a bow to match. I added the elbow length gloves for a touch of style and then to finish the outfit I drew in the small top hat with the feathers. The sixth caricature is a great mom, teacher and friend. I’ve known this person for many years and I wanted to show that she is not someone to mess with. I started with a short sleeve shirt with a corset but then I added the dagger on the sleeve. I had her in a pair of pants to show that she doesn’t conform to what society says to do. I drew in a pair of repeating pistols that are very similar to Han Solo’s gun from Star Wars. I then drew in the gun belt, goggles and pouch but the big thing was her hair. She once had dreadlocks and I wanted to draw her with dreads. It was a bit of a challenge but in the end I liked the end result. The eleventh caricature is a wonderful teacher and a lovely person that thinks of the students in everything she does. She is a bit quiet but she is always there to lend a helping hand. I wanted to draw her caricature a little riské, therefore I began with a corset and instead of a blouse I added a sheer top to show off a little cleavage. I then added a short skirt that allowed the caricature to show off her stockings and garters. Then I drew in the knee-high leather boots and a side pack. I had her hair come down onto her shoulders but I added a lady’s hat with feathers for that elegant look. The one thing that was different then the other caricatures is that everyone had either a necklace or earrings that had one gear as a piece of jewelry. Yet with this caricature I drew in three on her necklace. This is because she was my secret Santa and it was part of a game I did when I game everyone the final portrait with everyone on it. The thirteenth caricature is a wonderful teacher who is a good person through and through. She is a quiet soul and will always help you whenever asked. I have always thought of her as resembling Ariel from the Little Mermaid, therefore I decided to draw her caricature with this theme in mine. I began with a corset and then instead of a frilly dress, I drew a skintight dress along the thighs and then it would frill out at the knees to represent a mermaid’s tail. I added a blouse that showed some cleavage and a belt and feather hairpin. I added the navigational instruments of a compass, eyeglass and pocket watch to finish the look.